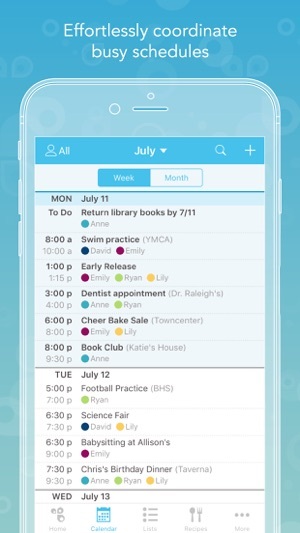 Cozi Family Organizer is the surprisingly simple way to manage everyday family life. 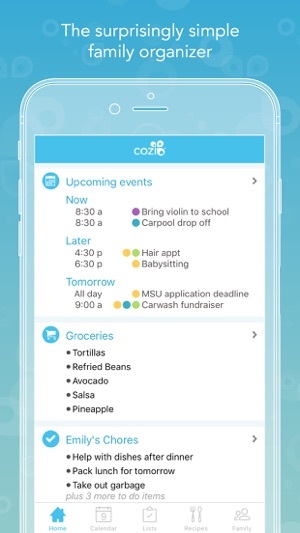 With a shared calendar, reminders, grocery list and more, Cozi is a 3-time Mom’s Choice Award Winner and The TODAY Show “must-have app” for a better life. Cozi is free, easy to use, and available from any mobile device or computer. All the features listed above are free. 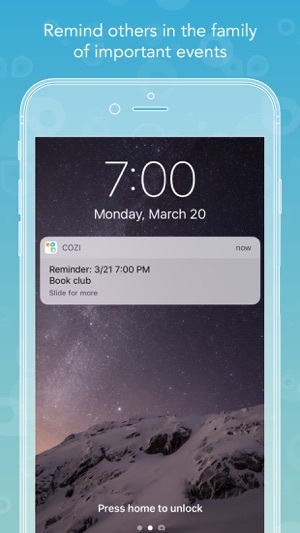 Cozi also offers an optional ad-free premium subscription called Cozi Gold which gives you additional features like Contacts, Birthday Tracker, mobile app themes, more reminders, mobile month view, change notifications and more. Cozi Gold is $29.99 USD per year. Price may vary by location. Your subscription is charged to your credit card through your iTunes account and will automatically renew unless you cancel at least 24 hours before the end of the current period. You can manage your subscription in iTunes or visit Settings in Cozi after purchase. Thank you for using Cozi! This release contains a few minor updates to help us serve you better. If you have any questions, problems, or feedback, please contact us anytime at help@cozi.com so we can help you directly. 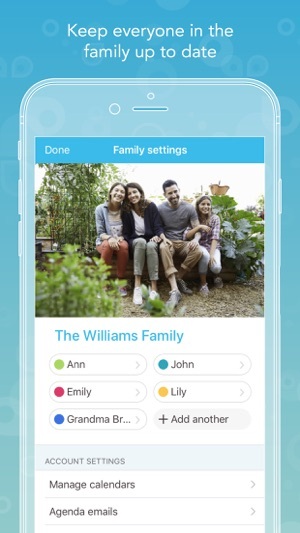 The good: It successfully fulfills the purpose of having a ‘family management app’ and it’s nice that it has the ability to notify family members of events with multiple reminders. I LOVE the recipe tab and like that it is easy to transfer those ingredients to the shopping cart. I appreciate that my husband and I can keep track of what’s going on and what’s needed all in one place. The bad: not entirely super user friendly, in that it’s easy to do things but not as easy to undo them. 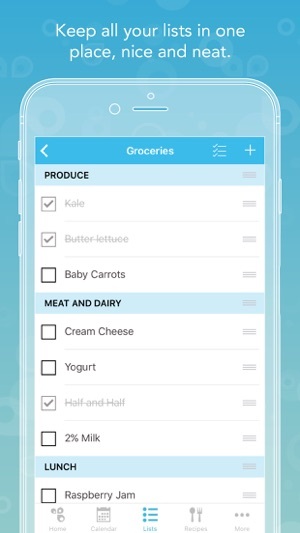 Like when you transfer the ingredients to the shopping cart, you have to individually delete each item as needed rather than selecting multiple (at least on the mobile app, it sure how that part is on the desktop). You can’t just select an entire recipe and delete if you accidentally add it twice. Also, I putting a ton of appointments was way easier on a desktop (at initial startup) than on the phone, but adding individual events is fine. Lastly, I added my kids as family members only to keep my husband and I in the loop of who is where, and it’s frustrating to have to uncheck their names in the “notify” section because they don’t have their own emails so I was getting five “notifications” since it was mine plus 4 of them until I started removing them. It could be a little smoother in that aspect. Overall though, the price is good for what you get (I NEVER pay for apps, but was willing to for this one!!) it’s been a life saver but could use some improvements. 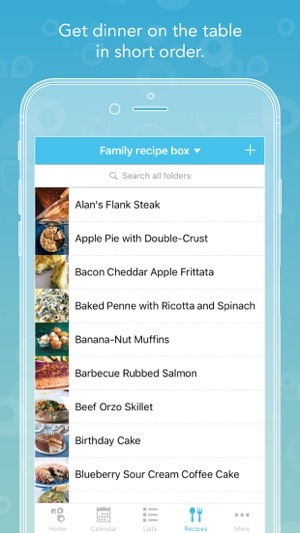 I found this app looking for something to help with meal planning and was glad to see it had calendar features too. Unfortunately the recipe suggestions and categories are useless if you're looking for vegetarian recipes -- and the idea of being able to search just for dairy free (or vegan) options is a joke. I tried to search for "vegetarian" and got zero results even though I'd already saved one recipe that claimed to be a veggie twist on a traditional meal... so maybe the recipes are there, they just don't make them easy to find. Lots of meat recipes though, if that's your thing. But here's the real problem: I like a lot of the features, but was disappointed that some things I'd like to be able to do require annual membership payments. I'd be willing to just pay a flat fee for the app, but considering how much they're asking for monthly or yearly memberships they'd probably ask a ridiculous amount for a one-time purchase to unlock all features. My main issue with paying monthly to unlock features is that there are only SOME that I want to use. It's expensive to pay the subscription anyway, but when you only want one or two features...? Forget it. Maybe they could make cheaper, flat-rate purchase packs that unlock only certain things? I dunno, it seems crazy expensive to me for what it is and what I'd use it for. I'd rather just stick with google calendar and a free app or two to fill in the blanks (like to do and shopping lists).